Now that we’ve sprinted past the mid-point of summer and the debauchery (and discombobulation) of a mid-week Fourth of July, we can focus on what’s really important: college football. For those who don’t know me, I’m an official card-carrying college football addict. There’s nowhere I’d rather be on a Saturday afternoon between September and January than sitting in front of a giant TV with a cold mexican beer in my hand. Nowhere! And for those of you who disagree about the beauty of college football, I ask you with all sincerity: where else would anyone possibly want to be?! I mean, I know college football doesn’t have the passing game of the NFL or the big egos of the NFL, but ultimately, football is football with touchdowns, helmuts and seriously rabid fans. What the NFL doesn’t have, though, that college football will always have is the game. It’s just not about the game in the NFL. It’s about the money. In college football, the game’s the thing. The game is bigger than everything and everyone. The economics of the NFL just doesn’t lend itself to creating the kind of passion that brings 110,000 people out every. single. week. of every. single. year. 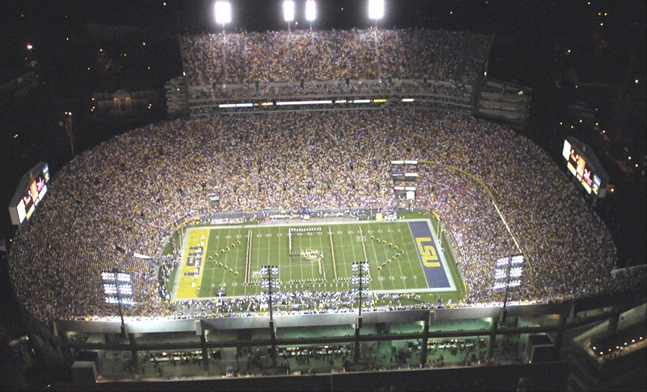 to Tiger Stadium to watch the LSU Tigers play on a Saturday night in the sweltering heat of September. It doesn’t matter what happens to the coach or the players because that isn’t why people come. The people are still going to come regardless of Saban selling out to go to Miami or Jordan Jefferson not starting because of a silly bar-room brawl. The NFL may have fans, but they aren’t, and never will be, as passionate as college football fans. The tailgate parties, notably in the SEC, and the complete zeal of watching “your school” beat a nationally-ranked team (I’m looking at you, Boise State over Oklahoma) will just never be matched in the NFL. Frankly, the NFL will always be handicapped because of its collective lack of imagination. I can turn on a game on any Thursday, Sunday or Monday night, and will see the same exact plays every. single. game. Where’s the innovation? The NFL is always going to punt on the fourth down. They’re always going to be defensive. Always. This is because, in the NFL, it’s about self-preservation and self-promotion, rather than playing your heart out for “your school” and for something bigger than yourself (and, yeah, usually for a #1 draft spot and NFL contract, sadly). For those who don’t know me, you should know I bleed both maroon and white, and purple and gold. I graduated from Texas A&M University (whoop! ), but am an ardent, ebullient, devoted LSU fan (Geaux Tigers!). Needless to say, a lifetime of prayers were answered the day I learned A&M had joined the SEC. I immediately began speaking in tongues and high-fiving a million singing angels! And then I stopped and asked myself: did A&M just become Texas Tech? As much as I love college ball, I had to ask why A&M would ever want to deal with Alabama, LSU, Auburn, not to mention the SEC East? After years of beating our heads against the Texas and OU walls, and struggling to do anything in the Big 12, how are we all of a sudden going to elevate ourselves after joining one of the nastiest divisions in the history of college football? I’m sure a few of my Aggie bretheren thought exactly the same thing. But you know what? First and foremost, A&M is finally out of the shadow of big burnt orange. Everyone knows the SEC is a bigger and better conference than the Big 12, and A&M we can finally have our own identity rather than being just the team who plays UT on Thanksgiving night (tradition, though it may be). And even if LSU tramples A&M when they make the trip to Kyle Field in October in what will probably be one of the most fun and emotional games of the season, there will be about 100,000 of us who will watch the Auburn game the week after, and the Mississippi State game the week after that, and the Alabama game the week after that. Don’t get me wrong…if someone gave me free tickets to an NFL game, I’d go, especially if it was to a Cowboys game at the new Cowboys Stadium (HINT). Let me say this, though: even if Texas A&M lost this entire season, I guarantee you that tickets for the next season and the season after that will sell out. Early and often. I’m pretty sure that would never happen with the Houston Texans. I know it wouldn’t happen with the Astros or the Rockets because I’m pretty sure they stopped selling out years ago. And if that doesn’t prove my point, I don’t know what will. Love and reason are like oil and water. I love college football, rational or not. And you know why? Because in college football, nobody’s bigger than the game.